The General settings of the app allows you to set up how the app appears and behaves on the dashboard. The main menu consists of several options. The '*' designates a field which is required. Icon*: the icon to represent your app chosen from a list of icons. App Name*: name that appears on the app in the dashboard. Description: the descriptive text that appears on the app in the dashboard. 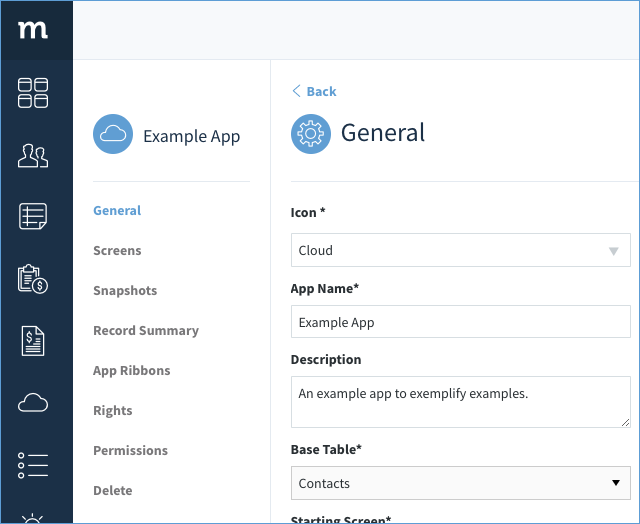 Base Table*: as we mentioned in the Database section, every app requires a base table for default configurations like app ribbons. For example, if you are configuring the Invoice App, it would make sense to use the Invoice table as your base table. Keep in mind, the process of creating a new app includes creating your first screen. That first screen will draw from the base table you chose for your app. Other screens in the app, however, can be based on different tables (you choose the screen’s table as part of the screen creation process). Method assumes at least one of your screens will use the base table for the app, so we assign this table automatically for the first screen. Note: Why would you want to use different tables for other screens? Imagine you were creating a basic Vehicle app to keep track of your fleet. New Vehicle, Edit Vehicle and Vehicle List screens would obviously be based on the Vehicles table, but what about Drivers? If you wanted to list the employees who drive these vehicles, a Driver screen would need to be based on a different table altogether. Next on the list are default screens. Starting Screen*: the screen that will load first when you open your app. In the Screens settings section, the starting screen is denoted by a Star icon in the top-right corner of the screen tile. Screen for User preferences: the screen used for user preferences. 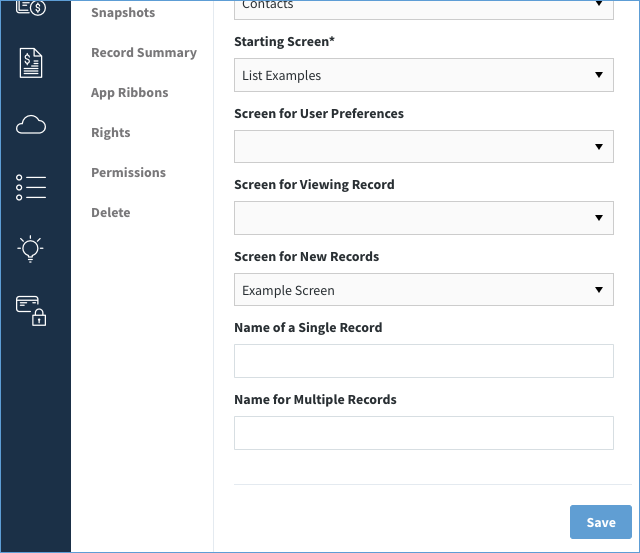 Screen for Viewing Records: if a user clicks on a record being displayed within an app ribbon defined in this app, they will go to the screen selected here. Screen for New records: if a user clicks on the ⊕ New link within an app ribbon defined in this app, they will be taken to the screen selected here. Name of a Single Record: Related to Record Summary, define how a single record is named. Name for Multiple Records: Related to Record Summary, define how a group of records are named.